We 18-35-year-olds love our 90's nostalgia. So much in fact that there is now a market for anyone wishing to capitalize on that nostalgia. That capitalization starts now. You have probably heard by now that Disney has signed on to do a pilot of a Boy Meets World spin-off (and all the land rejoiced). It's going to focus on Cory and Topanga's daughter and be titled...wait for it...Girl Meets World. What has amazed me so far is the total lack of cynicism surrounding this news. Usually people weigh the pros and cons when they catch wind of a revamped movie, spin-off or book-turned-movie. They consider how it could be great, but mostly how it could be terrible and destroy the integrity of everything that came before it. I consider myself an optimist and a lover of all things warm and fuzzy, so I of course ignored the (very) tiny voice in my head that said this could be a train wreck and embraced it with open arms. But the fantastic, however illogical, thing is...so has everyone else. At least in my circle of entertainment news sources and Facebook. EW's headline was literally: "'Boy Meets World' Disney spinoff: Great idea or the best idea?" No one is remotely concerned that "Girl Meets World" could actually be awful or, for that matter, even wants to entertain that idea. Because this is happening, you guys, and that's really all we could want out of life, you know? Especially with Ben Savage and Danielle Fischel on board. We're just excited at the mere possibility of this being a thing. Even Perez Hilton is pumped. If it were any other genre or a less-beloved 90's sitcom, this would never work. There would always be someone to oppose it. 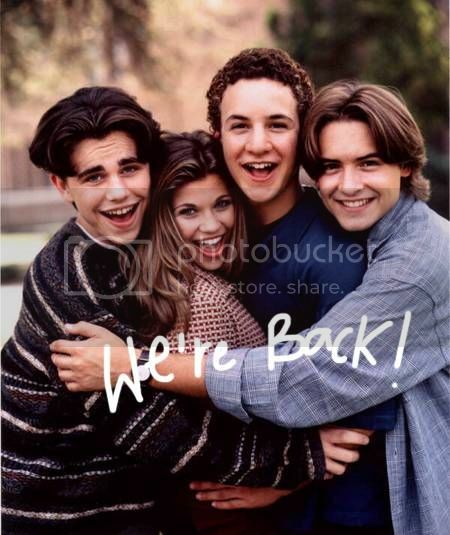 But Boy Meets World is the pinnacle of all things wonderful about 90's television. It is wholly and unadulteratedly adored by anyone who grew up in the 90's. And we are running towards it with all our might. After all, today is election day. And I think it's important to remember that amid our devisiveness, there's something we can all agree on: a Boy Meets World is the greatest. What character do you most hope reprises their role in the new series?